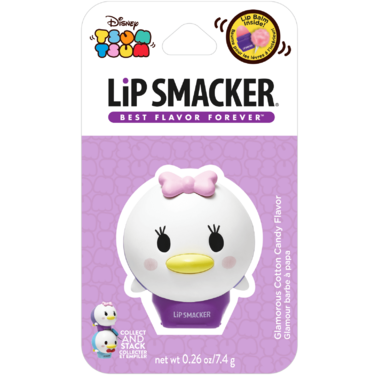 Bring the Disney Tsum Tsum game to life with these stackable, collectible lip balm pots in yummy special edition flavors. 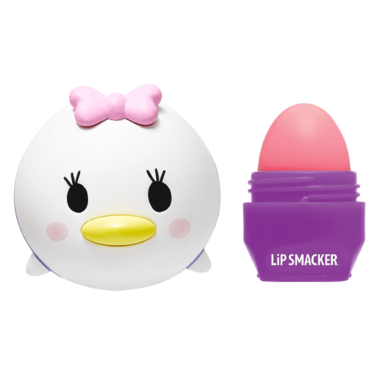 Conditioning formulas smooth and moisturize lips, leaving a delicious translucent shine. Collect them all! Enjoy this Glamorous Cotton Candy Flavor! Ingredients: Ricinus Communis (Castor) Seed Oil, Cetyl Acetate, Beeswax/Cire D'Abeille, Euphorbia Cerifera (Candelilla) Wax/Cire De Candelilla, Flavor/Aroma, Polybutene, Paraffin, Sesamum Indicum (Sesame) Seed Oil, Copernicia Cerifera (Carnauba) Wax/Cire De Carnauba, Hydrogenated Soybean Oil, Mineral Oil/Huile Minérale, Acetylated Lanolin Alcohol, Microcrystalline Wax/Cire Microcristalline, Triticum Vulgare (Wheat) Germ Oil, Stearic Acid, Stevia Rebaudiana Leaf/Stem Extract, Sucralose, Propylene Glycol, Propyl Gallate, Citric Acid, Phenoxyethanol, Tocopherol, Red 6 Lake (Ci 15850), Red 7 Lake (Ci 15850), Titanium Dioxide (Ci 77891). My daughter loved getting this in the mail to add to her collection. It smells so good !